On January 2 in India’s parliament, Rahul Gandhi, leader of the country’s principal opposition party, the Indian National Congress, led the latest in a string of aggressive attacks on the ruling Narendra Modi government over the 2016 Rafale deal. The speech was part of a debate his party had finally agreed to just days after India’s Supreme Court sweepingly rejected demands for a probe into the acquisition on allegations that it was a deal that involved corrupt compromises. But as Mr Gandhi was settling into his familiar acerbic cadence of charges, he allowed himself a stray comment while attempting to illustrate how the off-the-shelf purchase of 36 Rafale jets had deprived India’s Hindustan Aeronautics Ltd (HAL) the chance to build the aircraft on Indian soil. It was a telling, glaring error. “Gnat… MiG-27… Mirage-2000… all HAL-built aircraft,” Rahul Gandhi said, hoping to establish that aircraft acquired under administrations led by his party in the past, had gone on to be built in India. It was an attempt to jeer at the Narendra Modi government’s vaunted ‘Make in India’ program that has sought to make India a hub for manufacture. While Livefist fact-checked the obvious error in Mr Gandhi’s assertions — and it is unlikely that the error hasn’t been brought to his notice — the gaffe ironically strikes at the very heart of India’s present fighter aircraft conundrum. Unlike the Gnat and MiG-27, the French Mirage-2000 was never built by HAL, despite an offer that ran for over two decades to do so. And Rahul Gandhi’s error in asserting that it was an HAL-built jet actually amplifies the little known but damning genesis of the current fighter quagmire, where squadron numbers stand bedevilled by budgets, the monstrous cascading effect of poor planning and an ad-hoc acquisition ethic. By most accounts, it actually began by a Congress government’s decision not to build 110 Mirage-2000 jets at HAL in the eighties, and instead simply settle for 40 jets bought off the shelf from Dassault Aviation’s factory in Bordeaux. Simply put, the irony is this: if the Congress government, in the eighties, had actually decided to accept a French government offer to license build 110 Mirage-2000 jets in country by HAL instead of acquiring only a pair of squadrons off the shelf from France, a significant part of the country’s squadron woes — not all, mind you — would likely have been stemmed at the source. By all accounts, the Mirage-2000 has proven to be the sturdiest, most reliable jet in Indian military service. Air Marshal Anil Chopra (Retd. 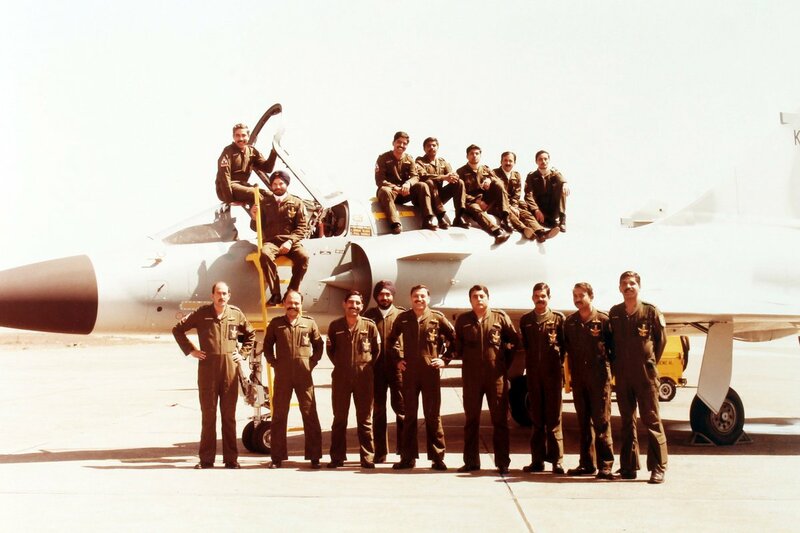 ), who as a young Squadron Leader, was part of the team that ferried India’s first Mirage-2000H jets back from France in the mid-eighties is among a large section of the Indian Air Force that rues what they believe was a historic faux pas that the country is still paying for today. “The Mirage-2000 was selected in 1980s to counter the F-16 sale to Pakistan. The aircraft has been most versatile and has maintained a very high mission success rate. It also for the first time brought in a modern air intercept radar and comprehensive electronic warfare suite. Since the contract signing in 1982, the French had offered Mirage license production in India — an offer that was open till 2006. The IAF was and is very happy with the aircraft. It had proved a game changer during Kargil. If the decision to make Mirage-2000 in India had been made then, IAF would not have been in the numbers and capability mess it is today,” says Air Marshal Chopra, who commanded the 1 Squadron ‘Tigers’ at Gwalior. 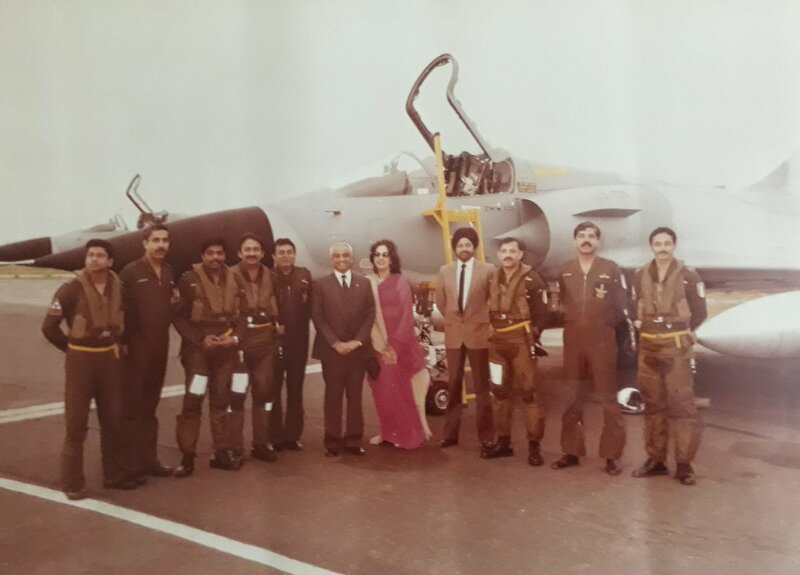 Wing Commander Anil Chopra seen extreme right in 1985 in Bordeaux, France before the first ferry flight of a Mirage 2000 back to India. In 1984, the Congress government with Indira Gandhi as Prime Minister ordered 40 Mirage 2000 jets with France. As this report from that time indicates, an offer to build a full HAL-administered Mirage 2000 production line in India was turned down by the government after the then Soviet Union successfully persuaded the Indira Gandhi administration to also purchase MiG-29 jets. In other words, the government of the day procured two separate jet types — the Mirage-2000 and MiG-29 — without choosing to license build either at HAL, settling instead for flyaway deals that only involved aircraft built in the makers’ factories in France and the USSR. Both aircraft types are currently involved in complex upgrade programs to improve capabilities and performance. The French offer to build Mirage-2000 jets in India stood for 22 years from 1984-2006. After the Kargil War in 1999, the Indian Air Force strenuously argued with the Atal Bihari Vajpayee government of the day for more Mirage 2000 fighters, willing to even settle for the older Mirage-2000H variant, instead of the new 2000-5 variant that was now being built on Dassault’s line. A final opportunity to build the Mirage-2000 was finally dismissed, with a decision taken to conduct a contest for new fighters. It was in 2006, on the threshold of India’s M-MRCA fighter contest, that Dassault Aviation finally pulled the Mirage offer, and replaced it with a pitch of the Rafale jet. The M-MRCA contest, which intended to buy 126 fighters, with most built in India, finally collapsed, resulting in a truncated deal for 36 jets in 2016. The decision not to build the Mirage 2000 in India — clearly based on political considerations, since the IAF was near unanimously in favour of more Mirage jets — also exacerbated the Indian Air Force’s inventory nightmare, where it stands saddled with a multiplicity of different aircraft types, eroding the possibility of infrastructural efficiencies and economies on either aircraft. Air Marshal Padamjit Singh Ahluwalia (Retd. ), who commanded the Gwalior Air Force Station during the Kargil war, and oversaw the use of the base’s Mirage-2000 squadrons in precision bombings of Pakistani positions, has long held that India’s decision not to grab the offer of a Mirage 2000 production line in the eighties has had a damaging and compounding effect on India’s fighter aircraft situation. In effect, the Congress government in the eighties did precisely what the Congress Party now accuses the Narendra Modi government of doing — turning down the option of building an aircraft in India and instead deciding to buy more aircraft of a totally different variety. And it was this act that has had a snowball effect on India’s fighter strength and planning. India is on the threshold of a contest to choose which foreign fighter it will build 114 of in India through a strategic partnership with a private sector company. The Rafale squares off against the American F/A-18, F-16, Swedish Gripen E, Russian MiG-35 and Su-35 and the European Eurofighter Typhoon. India’s first of 36 Rafale jets arrive in September this year.